The proposed new commission creates the necessary linkage between good water-use data and water management, a significant improvement to the current process of managing BC’s most precious resource – water. The business case proposed by the OBWB envisions a new commission that would manage water and build on the made-in-BC Water Use Reporting software developed in the Okanagan and piloted in the Okanagan and the Regional District of Nanaimo. While there is provision in existing laws (and supported in Bill 18) for water license holders to measure, record and report their water use, the requirement is largely discretionary, and there is no legal requirement for it to be applied consistently – or to be applied at all, depending on the circumstances. The reporting that does occur is generally paper-based, which limits how the information can be used in local and provincial resource management and planning activities. The BC Water Use Reporting Centre is a simple to use, successfully piloted (Okanagan and Nanaimo) electronic water reporting tool that supports groundwater, surface water and agriculture water reporting. Implementing BCWURC throughout the province will provide an efficient means to support improved water data collection services and support the new areas of water management identified in Bill 18 including groundwater licensing. The new Act requires all large-volume water users to record and report their water use and related information. Smaller-volume license holders could also be required to record and report water use in specific (e.g. area-based) circumstances to be established in regulation. Homeowners and small businesses connected to municipal water systems would not be directly affected by these requirements, but their local government or licensed water supplier would have a duty to measure and report water use. Both ground and surface water use have been included under the new Act. Improvements to the current water use reporting system will need to meet these more extensive reporting requirements and enable better use of the information collected. Other provinces and states have recognized online water use reporting as an efficient and cost-effective method to collect and manage water use data, and such systems are currently utilized in neighboring jurisdictions (Alberta and Washington) and other jurisdictions across North America and around the world. A paper researching water use reporting case study that includes a table comparing some noteworthy provincial and state online water use reporting systems is attached below. In British Columbia, a pilot BC Water Use Reporting Centre (BCWURC) has been operating successfully in the Okanagan Valley for the past three years, and a second pilot was recently launched in Nanaimo. BCWURC consists of a database, data reporting software (including analytical tools), and an online interface. BCWURC allows license-holders to report water usage online on a monthly basis, and currently supports data gathering for water usage, reservoir/lake levels, snow depth and water return flows. BCWURC was developed with $400,000 in senior and local government support. Further information on BCWURC is available below. The current structure and staffing for collecting water licensing fees and water use data will be challenged to meet the increase in these obligations under the new Act, as well as public and stakeholder expectations for timely, consistent and accessible water use data and transparency in provincial water management decision making. The current administrative separation between water users in oil and gas development from other water users in the province also raises concerns of inconsistent or unfair application of water management principles and processes amongst water users. The legislative proposal for the new Act states that “water is British Columbia’s most important resource”, yet no single agency or department within the provincial government has water management as its exclusive or primary focus. One means for Government to confirm the importance of water in British Columbia and meet the challenges and obligations presented by the new Act is to consolidate all water user fee and data collection activities with one provincial agency dedicated to collecting and reporting all provincial water use information. Three governance options are presented, including: status quo, expanding government, and creating an independent commission. A complete business case exploring the creation of an independent commission is attached. The creation of a new independent commission provides a compelling case for a cost effective means to improving water management and governance services to all British Columbians and signals the government’s strong commitment to sustainable water management. 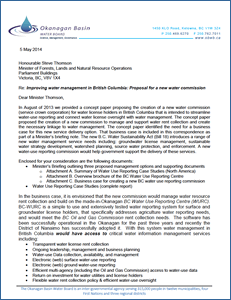 In October 2013 the Government of British Columbia released its proposal to modernize provincial water legislation, and to table this new legislation in the spring of 2014. The proposed Water Sustainability Act (Bill 18) was introduced to the legislature in March 2014. Bill 18 aims to make improvements in several key areas of water stewardship and management, including the measuring and reporting of water use in the province. Before the introduction of Bill 18, there were no provisions in existing legislation requiring the measurement, recording and reporting of water use from all water license holders, and there currently is no single, user-friendly provincial repository for this information. BC Living Water Smart provided an important road map for improving water management and increased services to license holders. Water licensing authority and oversight for collecting water use fees and data currently resides with the Ministry of Forests, Lands and Natural Resource Operations (FLNRO) and, for water use permits and license applications regarding oil and gas development, with the British Columbia Oil and Gas Commission (OGC). To enable greater efficiency, transparency and consistency in the use and management of provincial water resources, and to optimize fiscal and policy decision-making in provincial water resource management, the OBWB proposes development of an online provincial water use reporting system for ground and surface water use. It also proposes a new agency to manage the system and assume responsibility for all water license billing and water use monitoring in British Columbia, funded via water licensing fees.